Artists: Friday – The Tillers, Jack Klatt Trio, Eric Lewis & Rory Hoffman, Count This Penny, Dave Landau, Chirps Smith. Saturday – Dunken Catfish Ramblers, Dom Flemons Duo, Bradford Lee Folk & the Bluegrass Boys, Blind Boy Paxton, The Awful Purdies, Lil’ Rev, Loves It! !, Cajun Strangers, Erin Ribble & Tina Thompson. What to look for: A solid showcase for regional and national folk/blues/bluegrass acoustic songwriters and performers, complete with workshops and jam sessions. This year’s lineup showcases blues traditions, with the emerging prowess of Blind Boy Paxton, the witty wordplay of Jack Klatt, and former Carolina Chocolate Drop Dom Flemons sharing his encyclopedic knowledge of historic African-American music. Location: Unincorporated Symco – just north of Manawa, WI on STH 22. Artists: Friday – The Outta Sites, Honkytonkitis, Rumble Train, Lil Red and the Howlin’ Wolves, Tilford Sellers, Suns of Memphis, The Rotten Tommys. Saturday – Bible Belt Sinners, Surf Zombie, Madpolecats, Uptown Savages, JP Cyr & His Radio Wranglers, The Get Hot, Krank Daddies, Ditchrunners, Wifee & the HuzzBand, Cowboy & Friends, The Outta Sites, The Nightcrawlers, B-Side Revivals, Rodney & the Regulars. What to look for: Tons (literally) of vintage vehicles, customized or hopped up as if a 1958 issue of Rod and Custom came to life. Also, tons (literally) of solid rockabilly, psychobilly, surf, and hillbilly punk and traditional musicians from across the Midwest. 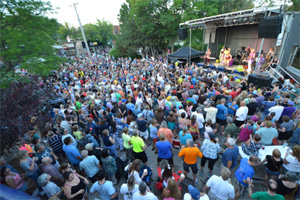 What to look for: Waukesha puts a different twist on the festival template by combining a juried art show with a lineup featuring noteworthy national acts, including the 2013 Blues Music Award winner Salgado. Make sure to come early Saturday for the lesser-known Gerome Durham – a Milwaukeean authentically rich with the sweet sound of southern blues. Artists: Friday – Los Lonely Boys, Curtis Salgado, Mitch Woods & His Rocket 88s, Trampled Under Foot, Jim Suhler & Monkey Beat, Bobby Messano, Scottie Miller Band, Izzy & Chris , Dan Phelps, Mark Cameron, Catya with Sue Orfield, Déjà vu Drifters. Saturday – Canned Heat, The Holmes Brothers, Selwyn Birchwood, Guitar Shorty, Sonny Knight & the Lakers, Crankshaft & the Gear Grinders, Reverend Raven & the Chain Smokin’ Altar Boys, RB Stone, The Pink Family Band, Lisa Wenger, Dave Lambert & the Motivators, Brian Naughton. Sunday – Robert Randolph & the Family Band, Dwayne Dopsie & the Zydeco Hellraisers, The Honey Island Swamp Band, The Steepwater Band, Mick Sterling, Cate Fierro, Doug Otto and Hurricane Harold, Annie Mack & the Big Top Gospel Revue. What to look for: One of the largest festivals in the region, the schedule is packed with national blues and zydeco bands sharing the bill with strong regional acts. What to look for: A tranquil spot in the Wisconsin River gets loud on Friday with top acts from southern Wisconsin; then Saturday looks west (Kane, Nemeth), South (RSB), north (Jones) and east (Sullivan) for artists who seldom play the Badger State. RSB blends the Allman and Neville family names under one banner. Need I say more? Artists: Friday – Jim Schwall/Chris Aaron Band, The Mustache, Cycropia Dance (Cycropia also performs Thursday). Saturday – Dirty Dozen Brass Band, JC Brooks & the Uptown Sound, Fareed Haque’s Flat Earth Ensemble, Josh Harty, Megan Bobo & The Lux, Primitive Culture. Sunday – Pimps of Joytime, Lydia Loveless, The Midwest Beat, Bill Malone’s Back to the Country Review, Sally de Broux. What to look for: Recovering from a tornado strike earlier this year, the park’s stately oaks have been thinned – but the lineup keeps a commitment to the up-and-coming (Lydia Loveless’ sublime country; Megan Bobo’s commanding soul-funk) and the masters (nimble jazz guitar master Fareed Haque; NOLA’s Dirty Dozen Brass Band). Artists: Lurrie Bell, Westside Andy / Mel Ford Band with Barrelhouse Chuck, Reverend Raven & the Chain Smokin’ Altar Boys, Dave Weld & the Imperial Flames, Stormcellar; harmonica workshop with Joe Filisko. What to look for: Relocated from the quaint community of Byron, the lineup is sustained by regional favorites and the astounding virtuosity of guitarist Lurrie Bell. The lineup with piano scholar Barrelhouse Chuck, Westside Andy Linderman’s passionate harp, and Mel Ford’s blistering guitar mesmerized audiences at last month’s Atwood Fest. Artists: Friday – Altered Five, Mo Jo Perry Band, Deep Water Reunion, DB Collective. Saturday – Tinsley Ellis, Jim Liban Combo, Reverend Raven with Westside Andy, Jared James Nicols Band, Deb Callahan, Matthew Skoller Band, Big N Tasty Blues, Joe Filisko Harmonicology. What to look for: Solid soulful acts on Friday (Altered Five; Deep Water Reunion) lead into a harmonica-rich Saturday, with Milwaukee’s legendary Jim Liban, Madison’s Westside Andy, and Chicago’s Matthew Skoller and Joe Filisko. If you haven’t become aware of Grafton’s profound role in the early history of blues music, you have some homework to do.